A couple celebrated their 86th wedding anniversary yesterday and offered some words of advice. While his 99-year-old wife Kartari is looking forward to getting her telegram from the Queen next year, she is conscious of the need to stay fit and healthy. She added: 'We have always eaten good wholesome food, there's nothing artificial in our diet but things like ghee (clarified butter), milk and fresh yogurt are what we like. The couple from Bradford, West Yorkshire, have eight children, 27 grandchildren and 23 great-grandchildren. 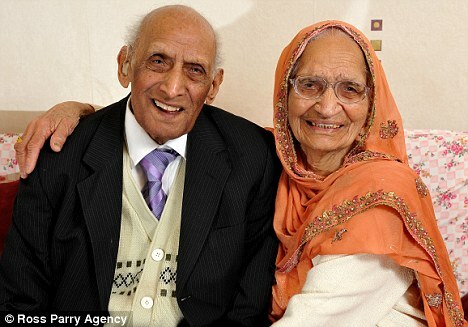 They married in India in 1925 and moved to Britain in the Sixties. It is thought the couple could be the UK's longest married husband and wife. Karam, who was born in a small rural village in northern India in 1905 kept with local custom of the time and married at a young age. Katari was also born in the Punjabi district in 1912 and they married in typical Sikh ceremony in 1925.